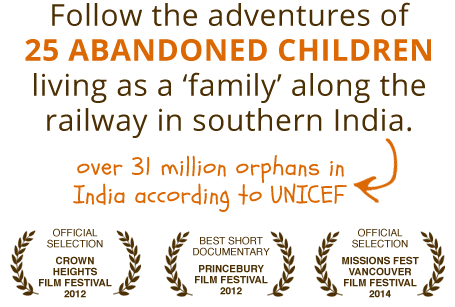 Mother India Documentary - 31 Million Orphans in India - How Will You Respond? Who Needs to See This Film? I want to HOST A SCREENING! On April 23rd, 2013, MOTHER INDIA will be released nationwide into bookstores, Amazon, and numerous other online retailers by Word Films. Word Films is set to release “Mother India: Life Through the Eyes of the Orphan” on DVD April 23rd. Yes, it’s on Amazon, but it’s also in bookstores. The Kids of MOTHER INDIA is a collection of full-color portraits by David Trotter featuring the 25 abandoned and orphaned children living along the railway in southern India that are seen in the documentary - MOTHER INDIA: Life Through the Eyes of the Orphan. The beautiful images capture the innocence in the eyes of each child in the midst of their struggle to survive. 1. Sponsor an Orphaned Child. For $35/month, you can save a child’s life and give them a safe, loving home. 2. Spread the Word Online. Your friends need to know about this film. Tell them, show them, and take action together. 3. Serve with Organizations Helping Orphans in India. Make a difference in your own country or directly in India.